Expansion Control Board. Provides 3 pots, 2 switches, 2 LEDs, Headphone jack. MIDI connectors will not be installed. This allows customer to wire in their own connectors. Audio jacks will be installed (snap-in) but not soldered. This allows you to remove them and wire in your own jacks. Orders are batched and shipped out once per week. The TGA Pro from Blackaddr Audio is a combined Two-Channel Audio and MIDI shield intended to make designing your own audio effects processing as easy as possible. Compatible with Teensy 3.2, 3.5 or 3.6. Isolated, analog power supplies for CODEC and preamp are generated using power from Teensy USB. Overall +24dB to -34.5dB of user-controllable input gain/attenuation. 2-channel input, 2-channel output configuration allows you to process stereo guitar pedals (such as reverb, chorus, etc.) correctly, or create your own mono-to-stereo effects. Analog dry output jack passively splits the output of the analog preamp. GPIOs available on user-installable expansion headers. Overload protection circuit for CODEC analog input. What sets the TGA Pro apart from other boards is it's specifically designed for connecting a wide range of audio sources. Onboard high-impedance preamps with adjustable gain permit direct connection of guitars, guitar pedals, or line-level sources using full size 1/4" jacks. High-quality audio-grade components are used throughout the signal path as well as onboard power circuits provide all the necessary voltages from the USB 5V. Full technical details can be found in the datasheet. The TGA Pro leverages the popular Arudino-compatible Teensy 3 series microcontrollers from PJRC. Arduino-compatible means you can use the same software development libraries and tools as literally millions of other developers around the world. Teensy takes Arduino one step further by offering much higher performance microcontrollers in a tiny form factor that is perfect for makers to use in their own custom projects. The TGA Pro is compatible with Teensy 3.2/3.5/3.6. The Teensy 3.6 is recommended for it's fast processing speed (180 MHz) and generous Flash and RAM memory. 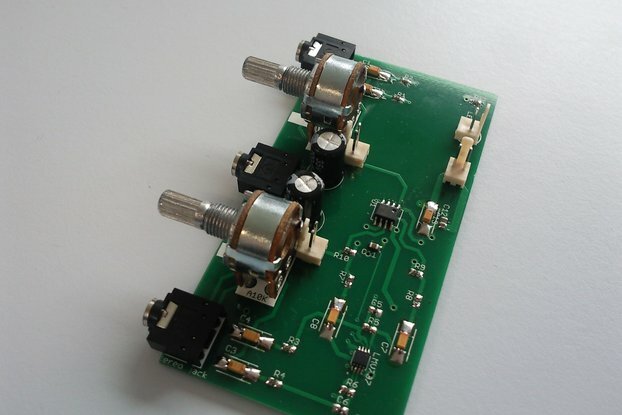 The heart of Teensy audio is the Audio Library by Paul at PJRC. This library allows simple connections between audio blocks while handling all the complicated audio transfer work. TGA Pro provides an audio CODEC and surrounds it with all the necessary jacks, preamps, power, input and output circuits for a ready-to-use audio processing platform. Blackaddr Audio has extended the PJRC Audio Library adding more custom effects examples and re-usable audio primitives to make building your own custom effects even easier. The entire platform is powered and programmed from a single USB cable attached to your computer. 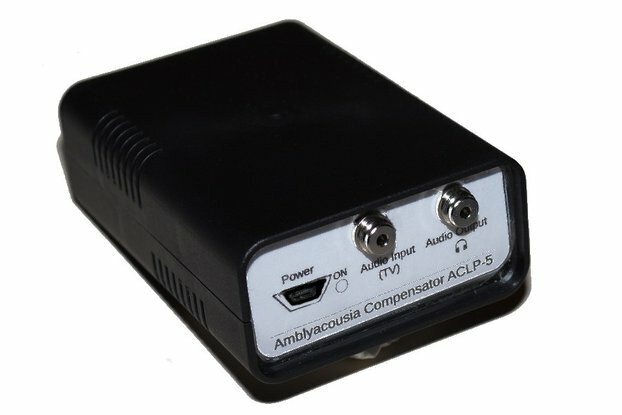 When you're ready to install in a custom enclosure, you only need to provide a 5V power source. Several ordering options are available to further enhance your project. EXTERNAL SRAM - One or two 1-Mbit SPI SRAMs can be added. Many audio effects require delaying audio (delay, flanger, double-tracking, etc.) or storing other large realtime data. Delaying audio requires buffering large amounts of raw uncompressed audio data in buffers which consumes large amounts of RAM. By using external SRAM for this data, longer delays can be achieved while keeping the on-chip microcontroller RAM free for running your program. With both SRAMS, delays up to approximately 3.0 seconds can be achieved. NOTE: this SRAM is for external data storage. It doesn't increase stack memory in the processor. The second SRAM uses the extended pins available on the Teensy 3.5/3.6. EXPANSION CONTROL BOARD - this board plugs directly into the TGA Pro and provides the physical controls you'll need for your audio effects. You'll have full control of your audio projects on Day 1, right out of the box!. The open-source schematics and code mean you already have a working reference for designing the controls for your custom project. When ordering this options, female headers will be soldered into your TGA Pro, no soldering is required by you. NOTE: requires Teensy 3.5/3.6. NO MIDI CONNECTORS - If you're planning to install your TGA Pro in a custom enclosure, you'll probably want to use your own chasis-mounted MIDI connectors and solder wires to the board. If you're installing in a small guitar pedal enclosure you may not even need MIDI and want the space to fit your mechanical stomp switch. In either case, you still get all the MIDI ciruitry onboard, this free option only removes the bulky connectors. AUDIO JACKS NOT SOLDERED - While the TRS audio jacks are designed with mounting nuts for easy installation in a custom enclosure, you may prefer to use your own. This option will install the snap-in audio jacks but will not solder them. This allows them to be easily removed so you can solder wires to the board instead. NOTE: snap-in fit may not provide a usable electrical connection. All software is open-source with many effects already available for use and modification. General Teensy software supported is provided by PJRC on their forums. Blackaddr Audio provides it's BALibrary software on Github. Getting started is easy for beginners: - use the free Arduino software tools with Teensyduino plugin - use the free graphical Audio Design Tool to build a project - use the open-source code audio library as starting point to learn, modify and create! Additional import taxes and duties may be applied by your country's customs services. These are not included in the amount paid to Tindie. 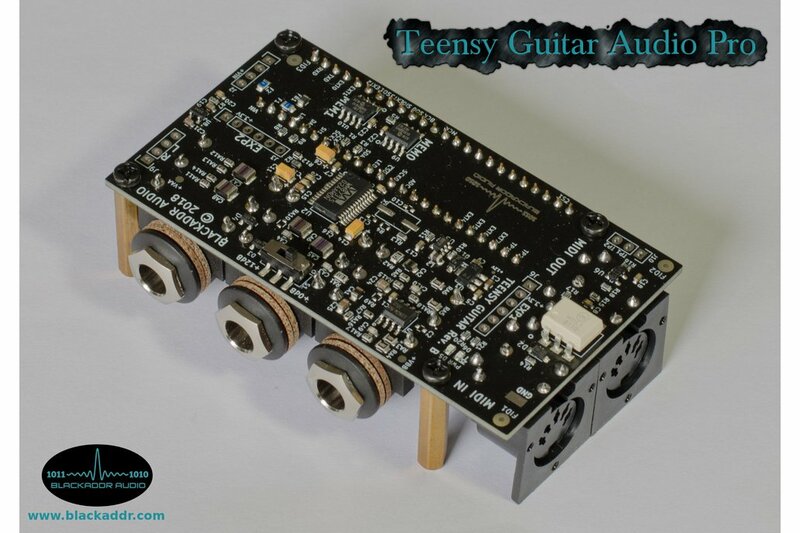 Teensy, the Audio Library and Audio Design Tool are copyright by PJRC who provides support via the forum.pjrc.com community. Orders are batched and delivered to USPS via cross-border service. Delivery time is up to 5 days for border crossing plus normal USPS shipping time. A great buyer. Prompt and courteous communication along with very past shipping - item was packaged with care. Thanks! I am developing synths on the Teensy audio platform. So I tried to get my port of the MDAPiano and Dexed to bring onto the TGA. I only needed to make some small additions to the used DAC in the code and it works! Now I just have to add small changes for the controllers to the code. I will release everything the next month. If you are curious you can check out the demo code at https://source.parasitstudio.de:63000/wirtz/BA_MicroMDAEPiano.git. The code ready for using will be released at https://codeberg.org/dcoredump. Thanks for this fine piece of hardware!!! Did not take long to get up and running with this board and a teensy 3.6! Timely shipping too. Great user guide/ documentation, quality board and example codes/ library. Was able to use the Blackaddr example codes and the Teensy visual audio dsp programming tool to make a variety of effects! Was able to use the pins on this board to add buttons/ rotary encoders, the PC based MIDI controller was great too. I would recommend this hardware for Teensy audio over trying to design your own instrument pre-amp & codec circuit. I have followed schematics for other projects and built my own pre-amps to interface my guitar with a Teensy 3.6, always had noise issues. Blackaddr nailed it, no noise at all. Well designed circuit. One could use this platform for a great variety of audio projects. Sounded awesome as a programmable guitar pedal, which is how I chose to use it. A very well produced sound card. Sound quality is amazing. Combines perfectly with teensy micro-controller boards; Bundled with its own example source code, and all the existing teensy audio library example source code, it is a perfect environment for developing digital audio effect processors. It's perfect for beginners and experienced engineers alike. It is clear that this product was created with love. Blackaddr has been very responsive to all the questions I've email him.